You can find renter reviews of our home on VRBO, see property #34623 - all 5 star. 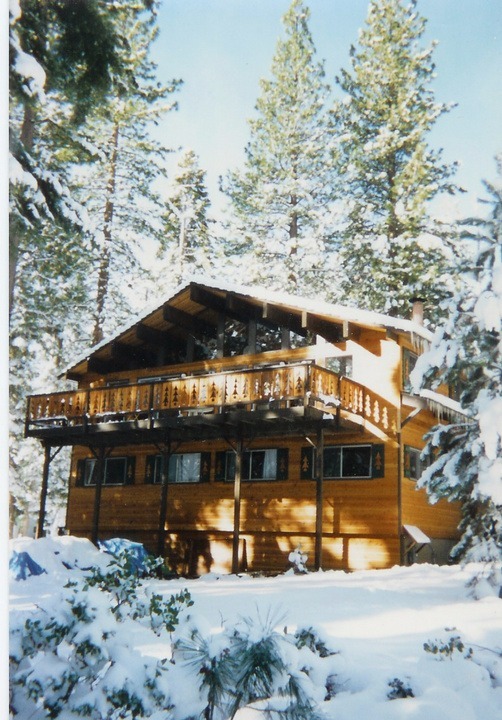 We have been renting North Tahoe Heaven since 1992. We are new to connectingrentals.com so we don't have any reviews posted on this site yet. 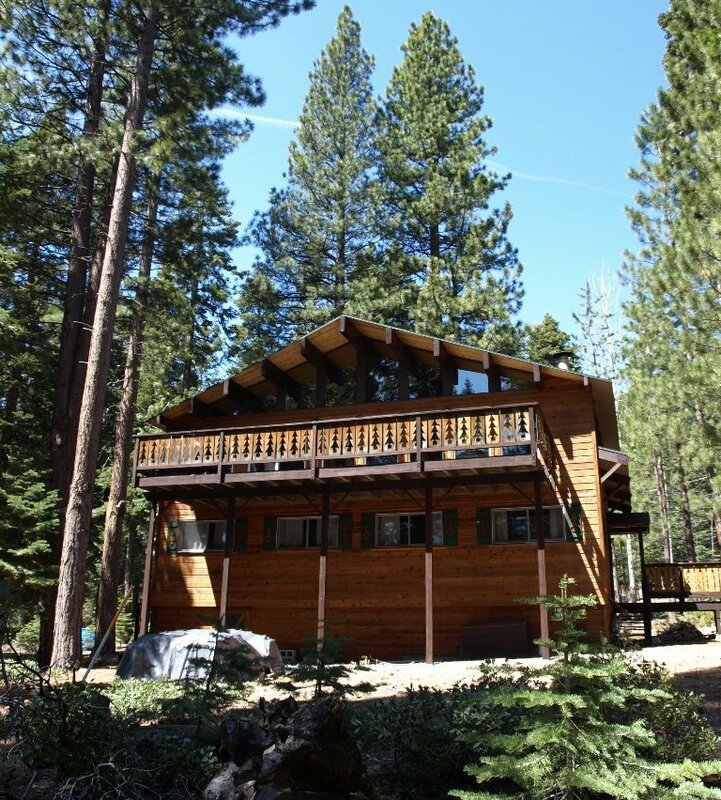 Our internet friendly, non-smoking mountain home has wonderful Tahoe ambience: old-style heavy-beamed architecture, knotty pine interior, two big decks and a wall of glass that looks out through a forest of pines to the lake. 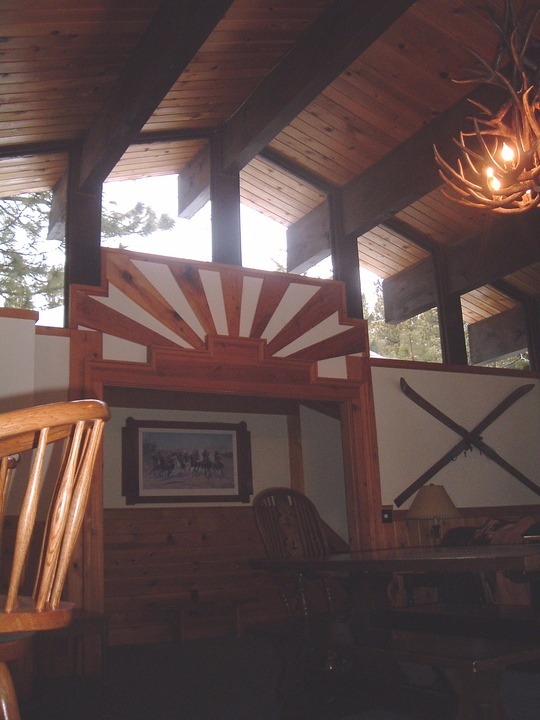 Antiques, artifacts of mountain living, lodge-style furniture, and beautiful prints and paintings all add to the feeling that you have arrived at a better place. 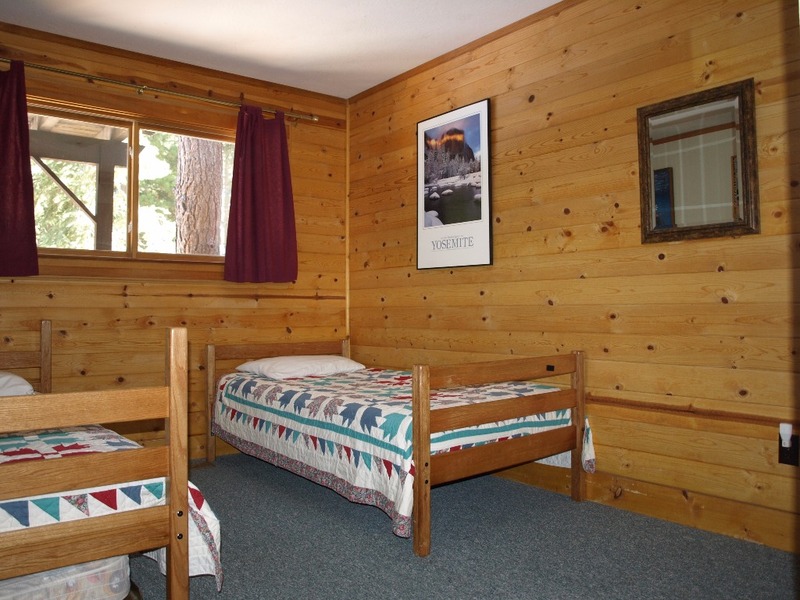 With a 40 foot great room, our Heaven is completely comfortable for groups of ten. At the same time, single couples have also told us how enjoyable it is to spend time in such a spacious environment. 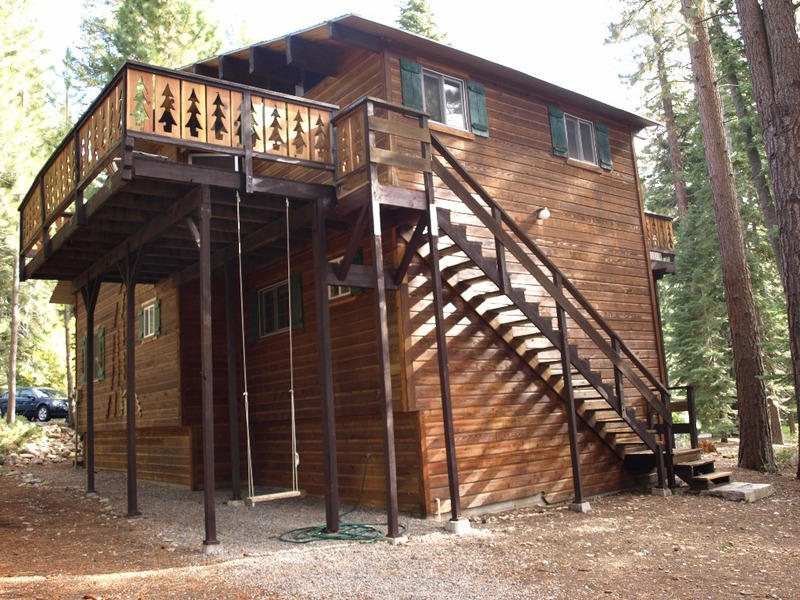 Moreover, our rates are low because we were fortunate enough to buy this house years ago, before Tahoe real estate prices tripled. Summer or winter, activities are close at hand. Walk to the lake, or to our gorgeous homeowner’s club with pool, volleyball court and tennis courts. 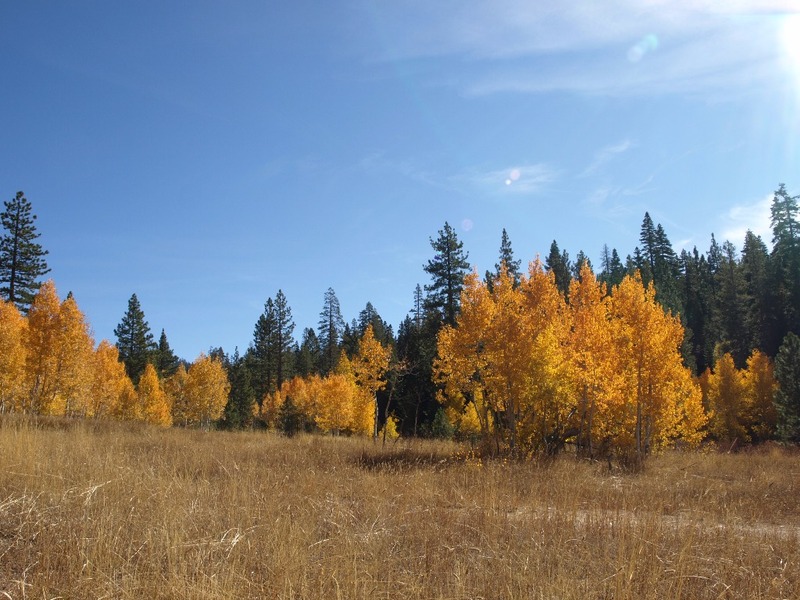 One block up are trailheads for hiking or mountain biking into the national forest. Seven ski areas, multiple golf courses, boating, parasailing and Nevada gambling are all just a short -- and breathtaking -- drive away. At night, snuggle up to fireplace (wood provided, naturally) or walk outside and marvel at the Milky Way, the blazing moon and shooting stars. 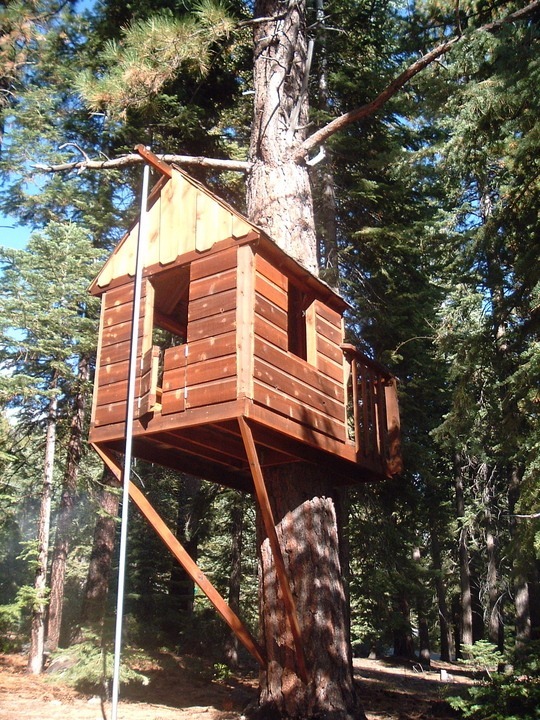 Children will spend hours in our tree fort, complete with sliding pole and its own deck! Five blocks up from Highway 28, we’re free of vehicle noise. Few cars come up our road, and children can play safely to their heart's content. Sleds and saucers, legos, toys and games can provide day-long children’s entertainment. 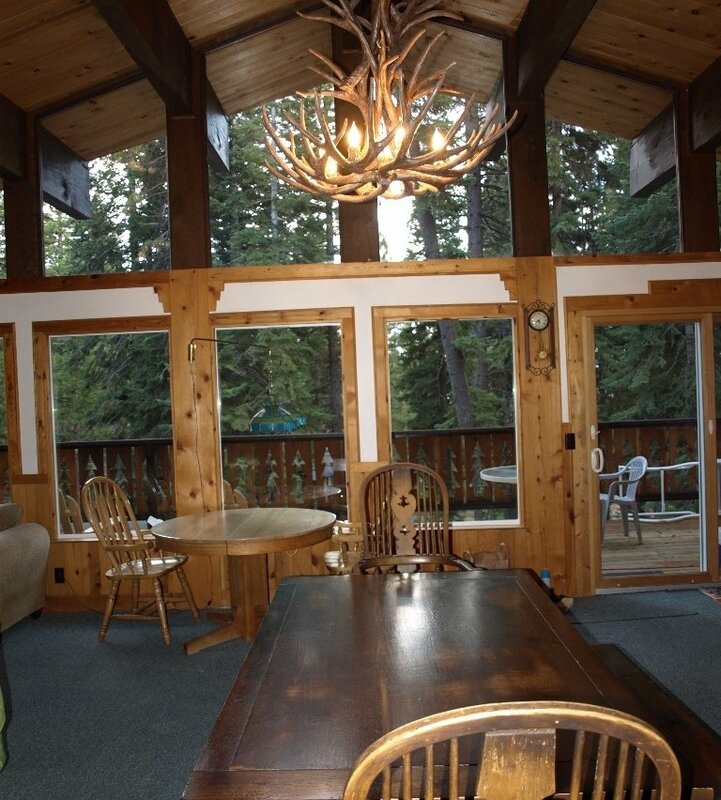 While brimming with old Tahoe charm, our home has every modern amenity. High speed wireless internet service is available. 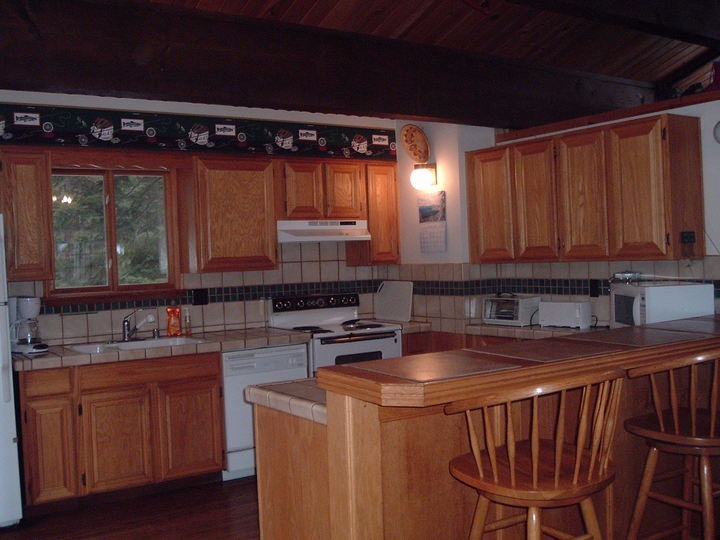 The kitchen is fully out-fitted, and the appliances are new. 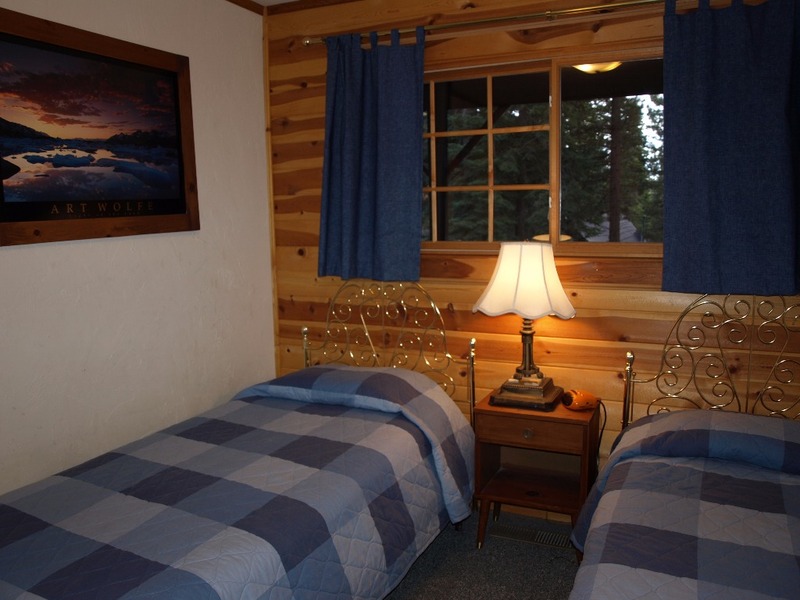 Three TV's including a flat-screen HD TV, VCRs and DVD players are available for your entertainment. A washer and dryer are on site. A library of children's videos is available for your use. 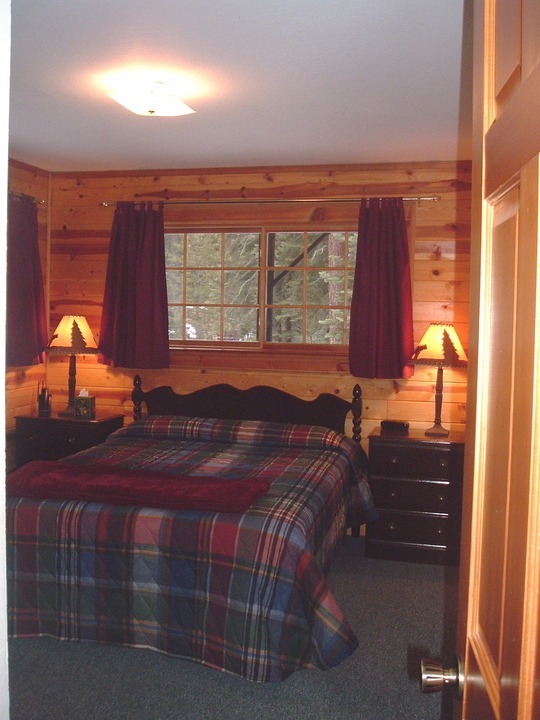 Our four bedrooms provide two queen and six single beds, with a queen sleeper sofa available in the great room. Linens are provided, and out on deck our Weber gas grill is ready to cook up your favorite meals. So leave those work boots behind, and come to Heaven. 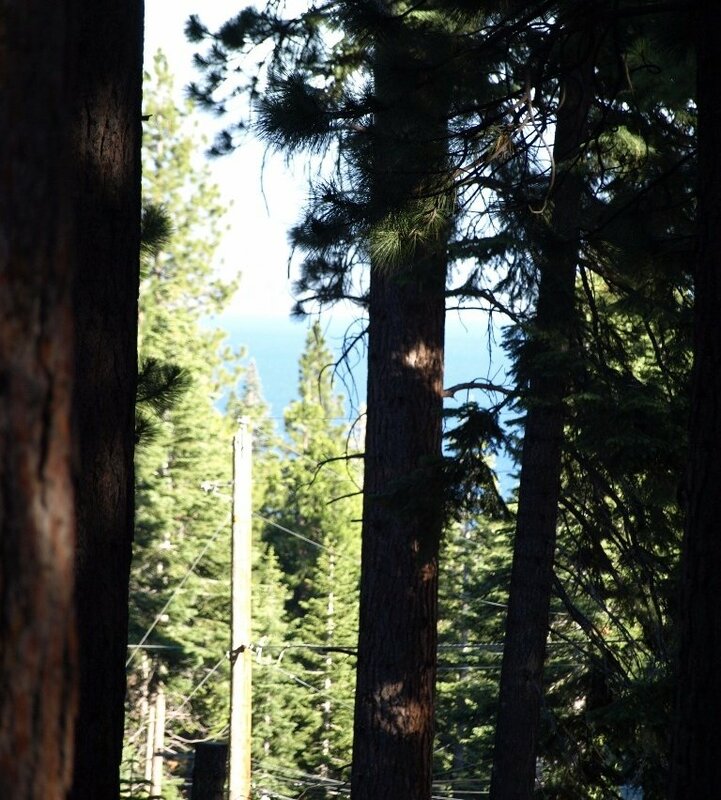 Come up to sunny days, clean mountain air, and the freedom to do nothing more than enjoy the thrill of being at Tahoe. From Highway 28 drive up Agate Road to Angola Road and take a right. Go one block and take a left on Tripoli road. First house on your left. The house has easy access from the parking area but does have a stairway to the upper floor, which is the living area. 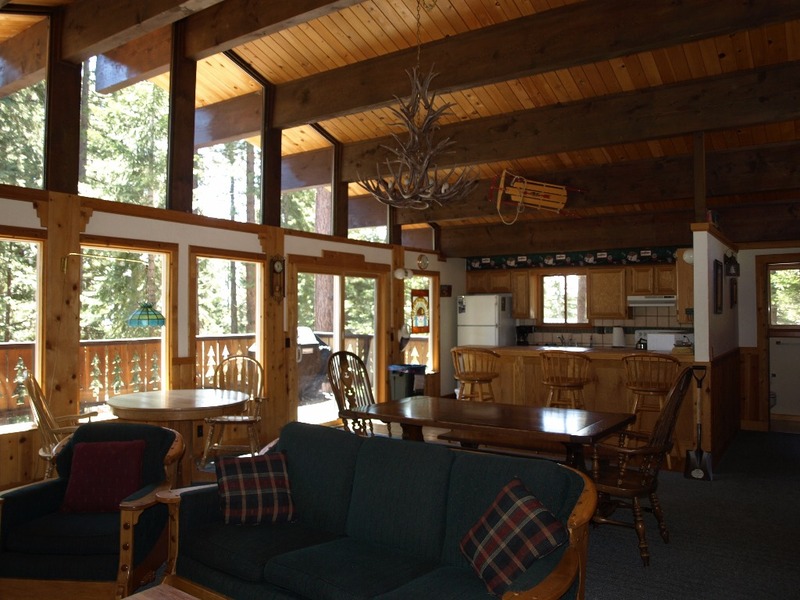 RESERVATIONS: A confirmation notice will be sent upon receipt of a $400.00 security deposit ($300 for weekends). The deposit will be returned to you when you return the keys, provided the cabin is left in the same condition in which it was found. CANCELLATION POLICY: Summer reservations must be cancelled by May 1 in order to give us the chance to re-book the cabin. Holiday reservations must be cancelled 60 days in advance, and other off-season reservations 30 days in advance. Cancellation after the applicable cancellation deadline may result in the loss of the security deposit or rent if we are unable to re-book the cabin. So long as we can re-book, we will refund your deposit in full. CHECK-IN and CHECK-OUT TIMES: Check-in is 4:00 PM of the day arriving, and check-out is 11:00 AM of the day leaving. This five-hour window is necessary to allow time for cleaning between renters. Early check-in or late check-out may be possible (but unlikely in summer). Inquire first. 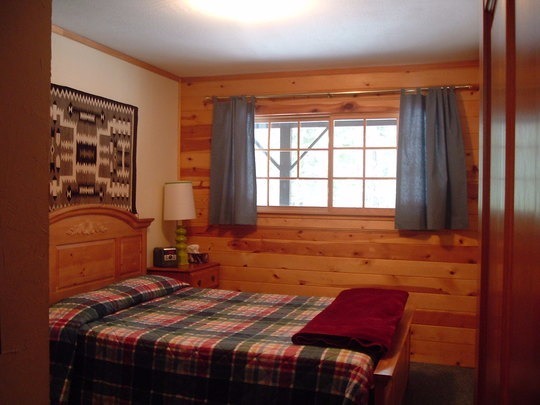 LINENS AND BLANKETS: We provide all bedding as well as towels. We will need to know how many persons are in your group, however, in order to have our housekeeper set out the right number of linens. GARBAGE PICK-UP: Monday is pick-up day. Two cans are located in the bear shed by the parking area. Do not overfill the cans or leave extra bags of trash on the ground. We provide recycling bags; use them to save room in the cans. POOL, SPA & TENNIS COURTS: Open from mid-June to Labor Day. There is a charge to use the facilities of $40 for each renter group, waived for full week rentals. INTERNET: Wireless internet is available in the house. We will provide you with the system name and password when we sent the keys. SMOKING: No smoking is permitted indoors. • Check-in time is no earlier than 4:00 PM. Early arrival, including the drop-off of luggage or other items, is not possible in summer because cleaning will be in progress. • Check-out time is no later than 11:00 AM in summer. This is necessary to allow complete cleaning before the next guest checks in. Late charges of $20.00 may be assessed for each half-hour of late check-out. 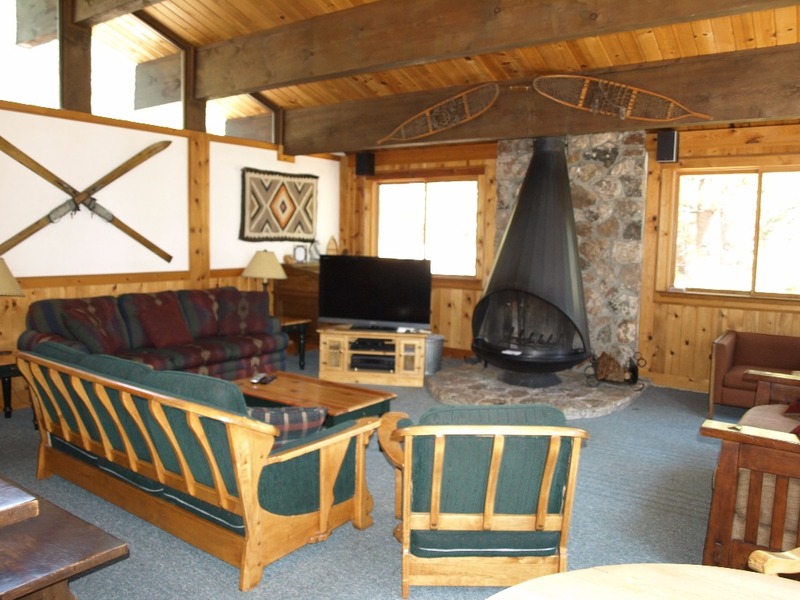 • Fires in fireplace are prohibited in summer and early fall due to high fire danger. 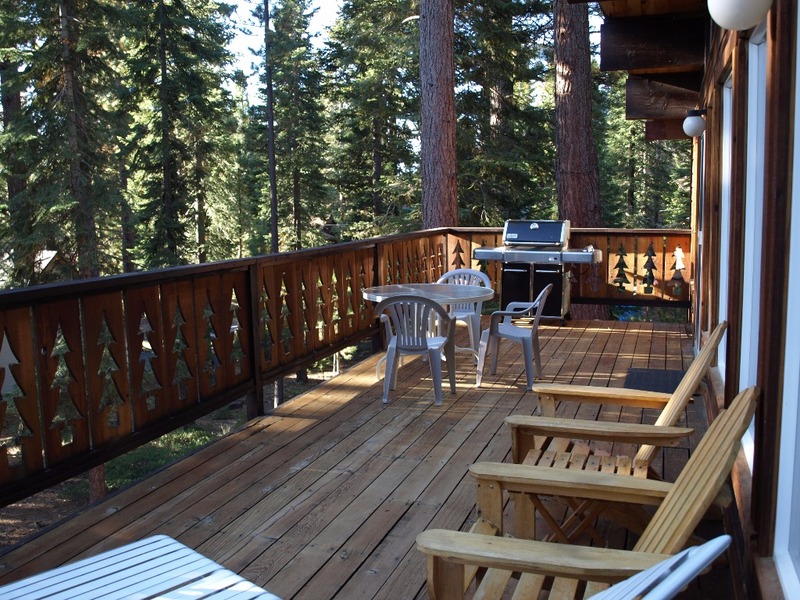 After the fire danger period passes, firewood is available under the main deck. • BEAR SAFETY: Bears want people food. When you go away from the house lock the doors and close the upstairs windows. Don’t keep food in your vehicles. If you see a bear, make noise – yell, bang pots, etc. Bears are easily scared off. But if they get your food, don’t try to take it back. • TRASH handling. Two trash cans are in the shed next to the parking area. Keep the shed bolted. Do not overfill the cans. The collection company won’t take cans that weigh more than 30 pounds. When this happens, you will be charged $29 (one can) or $38 (two cans) for a special pick-up. • RECYCLE. Put all aluminum cans, glass and plastic bottles, newspapers and cardboard, etc. in the recycle bin in the kitchen. Use the blue recycle bags only to line this bin. Find them in the middle kitchen drawer. (Use the white bags only to line the trash can.) When you fill a blue bag, tie with a plastic tie (in the drawer with the bags) and place outside the front door or by the trash shed. THE MORE YOU RECYCLE, THE MORE ROOM YOU HAVE IN THE TRASH CANS. • Site Safety: Children and adults should not go barefoot outdoors. Overall, renters are responsible or using the facilities, including the treehouse, in a responsible manner and avoiding damages thereto or injuries to their party. Have safe fun. • Do not move furniture. Extra charges may be assessed if the cleaning crew has to restore the original layout or if furniture is damaged. • When cooking on the stovetop, please remember that liquids boil more quickly in high altitudes. Please cook on lower temperatures or monitor food so that it does not spill over into burners. • Fresh linens (sheets, pillowcases, and towels) are provided. Please note that the zip-on pillow covers should not be removed from the pillows. Place a pillow case over them before using the pillow. • Heat. The thermostat is located upstairs by the utility closet. At night, it’s a good idea to turn it down to about 55. Otherwise, because of all the glass windows upstairs, the heat will run too much and the bedrooms will become uncomfortably hot. • No smoking indoors, and never throw cigarette butts off the deck. • Phones are for local calls only; please use your cell phone or a calling card (available at the Kings Beach Safeway or the 7-11 in nearby Carnelian Bay) for long distance calls. • The key to the tennis courts is attached to a wooden handle and will be on a hook by the upstairs phone. (Courts are open only in summer.) Please return to same spot if you use it. If missing, the club will charge $50 for replacement. • Extensions for the dining room table are in the utility closet. One extension can be inserted at each end of the table. Pull out the table ends to insert. • For safety, each shower has grab bars. There is also a bath mat in the larger bathroom. Please use it if you have any concerns about slipping. • Wireless high speed internet is available in the house. The wireless password key is listed on the bulletin board in the kitchen. • Gas grill – To use, first turn on the valve atop the propane tank. Be sure to turn off the valve on the tank when you’re done cooking or all the gas will leak out. Renters who use the grill are responsible to clean the side counters of food, grease, etc. caused by their use. The grill is not available in winter – snowed out! • A basic supply of paper towels, tissues and toilet paper is provided. If you run out, you will need to buy more. • Rent is due 30 days prior to your arrival. Make checks payable to: Robert Schladale, 164 Sierra Sunrise Way, Auburn, CA 954603. Tel. 916-601-9059. • Cancellation Policy: Summer reservations must be cancelled by May 1 in order to give us the chance to re-book the cabin. Holiday reservations must be cancelled 60 days in advance, and other off-season reservations 30 days in advance. Cancellation after the applicable cancellation deadline may result in the loss of the security deposit or rent if we are unable to re-book the cabin. So long as we can re-book, we will refund your deposit in full.